Today we are interviewing historical romance/paranormal romance author D.C. Cowan. 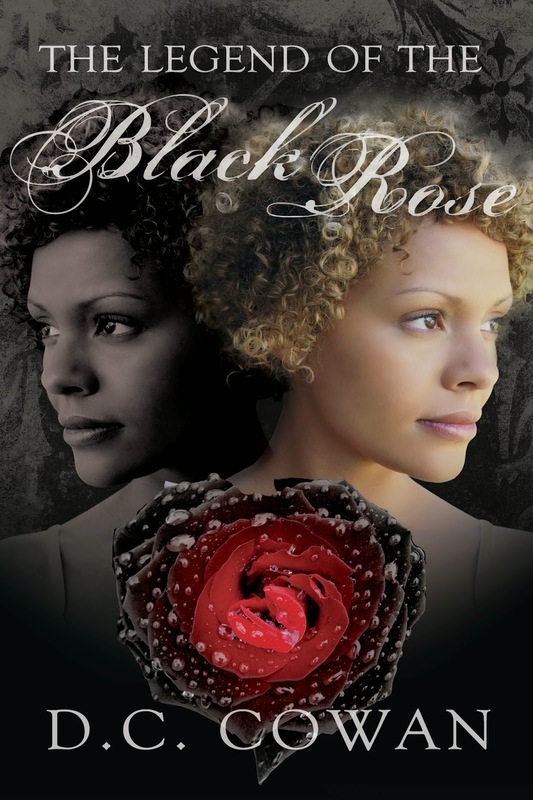 The novel, The Legend of the Black Rose, follows Dr. James Blakemore and Ciscely Raymond as they search for their identity and purpose through their association with the Black Mist spirit of the Black Rose, Kula Kyrni Kara. The book has a deeper meaning to it. Most of us identify ourselves by superficial triggers set upon us by whichever society we live in. This book delves into physically, mentally, emotionally, “going in search of”. It takes a look into a mirror of the character’s soul reflecting darkly hidden well kept secrets concerning our genetics background. The book takes twists and turns, ending up with Ciscely coming face to face with the illegitimate son of Dr. Blakemore, Dr. James (Jim) Blakemore-Stoddard, a well-known Chicago psychiatrist, in search of his illusive father and his heritance. Which one of the many suitors in Ciscely’s life will she choose and whom will she lose in her obsession with her claim to the heritage of her ancestor, the Black Rose? Adults interested in psychology, philosophy and interested in historical fiction with an element of mystery and romance. Also, preteens, teen and young adult age group especially females interested in their genetics or heritage. Great, Great Grandma Ginnie’s legacy as told my Grandfather William by his mother Louise, passed down to my mother, then to me. James (Jim) Blakemore-Stoddard and his shadow Mama Duvantée, also in search of his heritage and inheritance as he interacts with those around him. Believe it or not, the dictionary/thesaurus which helps me improve my word choices as I write. Books concerning word origins, play on words, multiple meanings of words, clichés. I especially enjoy making up acronyms for real words and names. Changing over from very short stories in a few paragraphs to dialogue character descriptions and actions have improved my writing quality tremendously. Just the opposite has occurred for me, writing allows me to set my limitations and allow me to dream my dreams without superseding reality, to resolve issues without personal involvement thus I call them Fantasy/ Reality diaries. English per se did not list among my favorite subjects in school; instead, I loved the Arts including the Literary Arts, poetry, short stories, songs. I loved to read more than write. I enjoy using my abilities as an artist, songwriter, dancer, creator and illustrator to enhance the books I write. I create my own society of people, religions and healing techniques, etc , which adds to the authenticity of my works. In order to succeed, I must yield to change with the times. Ebooks prove people yet love to read as physical copies of books diminish. Whether electronic or physical copies of books, as long as people continue to read, whatever sells books has my approval. In the next ten years, I plan on organizing many of the stories my mother collected, write more books based upon other prompts and characters she entrusted to me, transfer her handwritten poetry and songs to computer perhaps to even use some in my writings. The next book in the Children of Kara series, The Legacy of the Black Karakuls, awaits its turn in the spotlight as a paperback or eBook. So far, my family members are my only fans. Only my daughter had the courage and incentive to pursue this lifelong dream. Yes, very supportive, especially by allowing me time, space, etc. to establish my career as a writer. My daughter is my editor, my publicist, designer and everything else that a traditional publisher would have. My son and husband have also been very encouraging during this process of releasing my first book, even financially. The need to rely so heavily on a computer. I grew up during a time with typewriters and everything was had written. In fact, The Legend of the Black Rose was handwritten and my daughter had to type it up for me. No, I have never had writer’s block, probably never will because I have an abundance of story prompts and fantasy/reality diaries my mother left me about her family and their past lives when the creativity slows down. Computer, faster more efficient. I let my daughter handle that. My next project will pursue the opposite profile of my first book (i.e. a villain instead of a heroine). It will explore the psyche of a person pretending to be whom she is not for personal gain with any tactic available to her to do so profitable to do so. The next book The Legacy of the Black Karakul stars another James (Colton Murphy) and Alpha Kara Talbot. Acronyms play a very important role in this series. I would like potential readers to know my book contain hidden meanings, as part of a series of books concerning very thought provoking issues of our times and those from the past, still relevant to them today. It deals with multiple topics such as anger, hatred, deceit, disloyalty, insanity, fear, desperation, etc. with even the potential for use as a therapeutic guide for people with the disorders featured in it.